On September 15, 2015, Swann Galleries' African-American Fine Art department will offer The Art Collection of Maya Angelou, with works from Dr. Angelou's private collection–much of which has never been publicly exhibited. Collection highlights include a painted story quilt by Faith Ringgold, entitled Maya's Quilt of Life. A quintessential example of Ringgold's work, Oprah Winfrey commissioned the quilt for Dr. Angelou's birthday in 1989. A monumental painting by John Biggers, Kumasi Market, oil and acrylic on masonite board, 1962, reflects both Biggers' and Dr. Angelou's interest in African culture. Left: Lot 36. John Biggers, Our Grandmothers, one of a set of five lithographs, 1994. Sold for $4,000 on September 15, 2015. 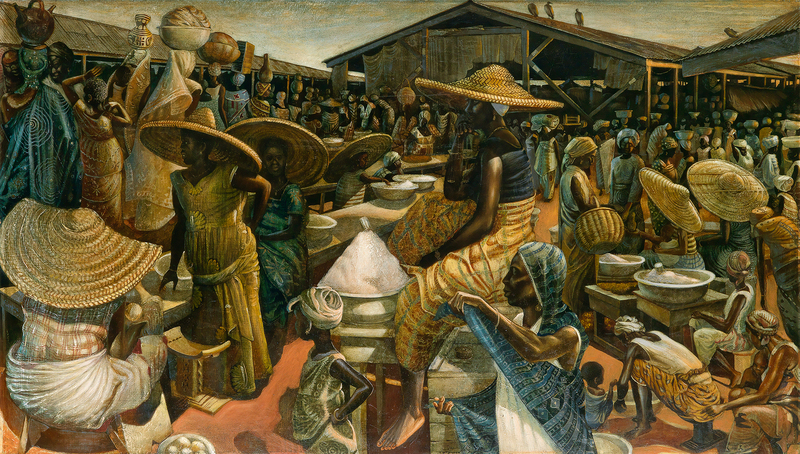 Lot 3: John Biggers, Kumasi Market, oil and acrylic on masonite board, 1962. Sold for an artist record of $389,000. 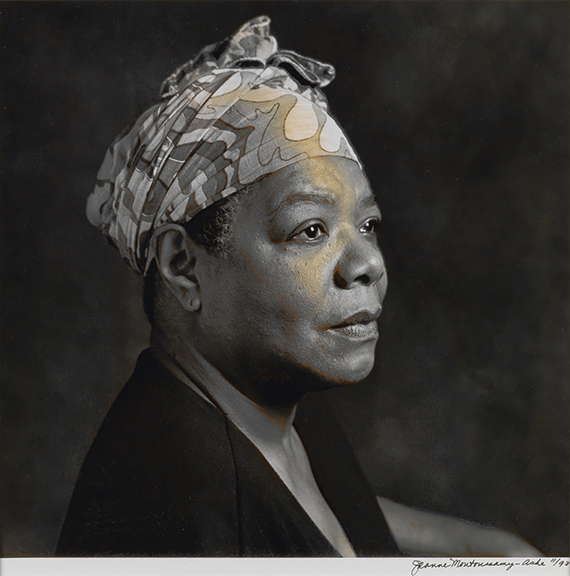 Lot 38: Jeanne Moutoussamy-Ashe, Maya Angelou, silver print, 1993. Sold for an artist record of $17,500. Though perhaps best known as a poet, writer and educator, Dr. Angelou spent her life fully immersed in artistic ventures of all varieties. From her early time as a dancer, to her appearances on Broadway and collaborations with artists from a multitude of genres, Dr. Angelou's passion for being creative and fostering creativity in others shines in this collection. Lot 32: Faith Ringgold, Maya's Quilt of Life, acrylic on canvas with pieced fabric border, 1989. Sold for an artist record of $461,000. 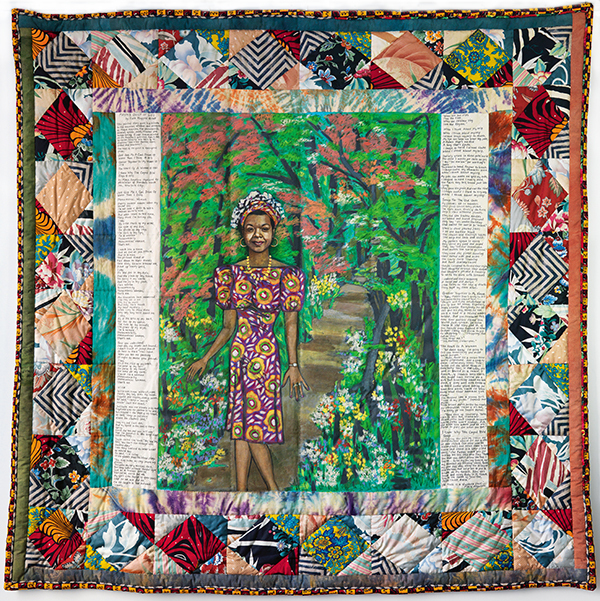 Many of the works in the collection were inspired by and gifted to Dr. Angelou, such as the vivid story quilt by Faith Ringgold (pictured above), which was commissioned by Oprah Winfrey for the author's birthday. Just as Dr. Angelou continues to serve as a source of inspiration for countless artists, writers and performers, she also found inspiration in the works of others. Dr. Angelou's son, Guy Johnson, wrote, "she surrounded herself with books and objects d'art because she liked to be inspired by the creativity and genius of others. She felt that the ideas and concepts expressed in well written books as well as the emotions and feelings evoked by intriguing and beautiful pieces of art expanded the deep, interior recesses of the soul." 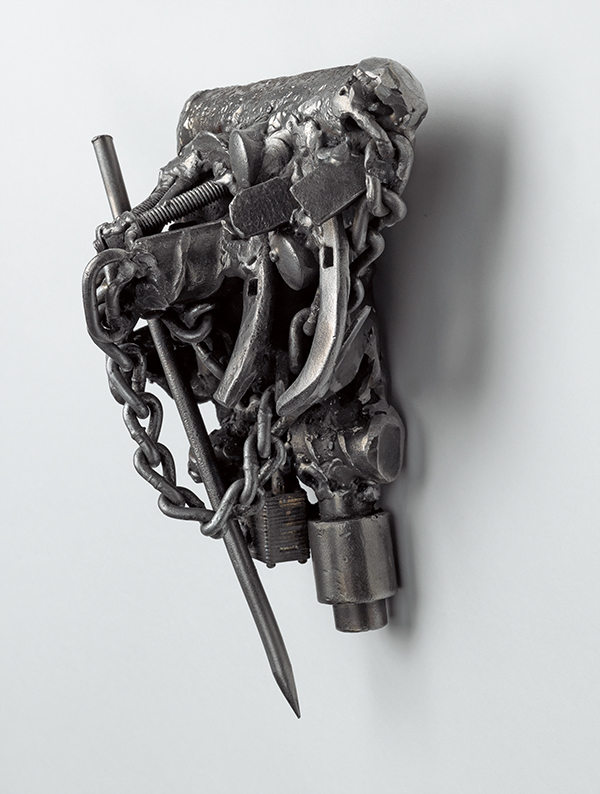 Lot 44: Melvin Edwards, OWWA Maya, welded steel, 2011. 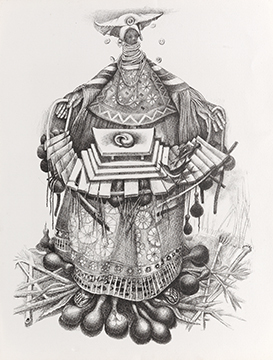 Sold for an artist record of $40,000. Lot 20: Romare Bearden, The Obeah's Choice, watercolor, 1984. Sold for $87,500. Much of the work from the collection has never publicly been displayed, making this a unique opportunity to see a more private side of such an influential cultural force. Additionally, the collection provides insight into how Dr. Angelou's interests aligned with the art and artists in her collection, from her interest in African culture, highlighted in John Bigger's Kumasi Market, to her tireless support of female artists like Elizabeth Catlett and Phoebe Beasley. 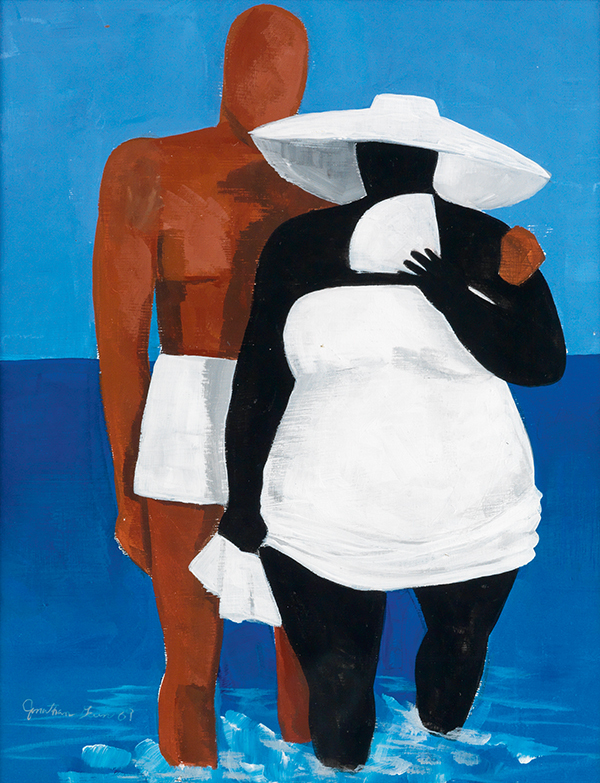 Lot 27; Jonathan Green, Wading in the Surf, acrylic on masonite board, 1989. Sold for $13,750. 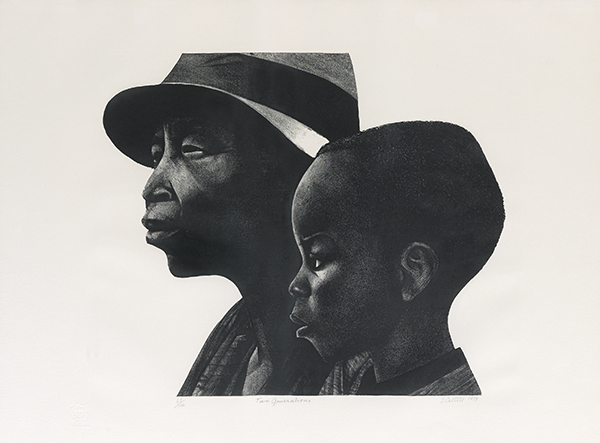 Lot 17: Elizabeth Catlett, Two Generations, lithograph, 1979. Sold for $8,450. For further information on the auction or the works seen here, contact Swann's African-American Fine Art department.